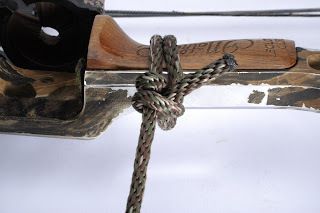 Here are three essential knots that every outdoorsman should master. By "master" I mean you should be able to tie them by feel in complete darkness. If you're ever caught without a flashlight in a pop-up thunderstorm and your gear starts blowing all over camp, you'll thank me when you can secure it quickly and securely. 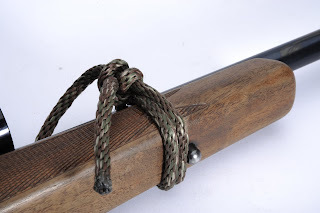 The video demonstrates how to tie each of the three knots, so the photos that follow are primarily to show how the finished knot should look. You can click on any of the photos to enlarge it to a size where you can easily see the details. 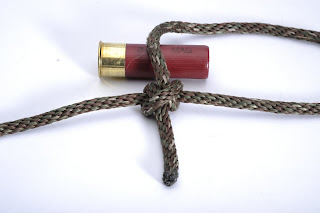 I also show you a handy way to coil and store rope so that it will be neat and tangle-free when you need it. 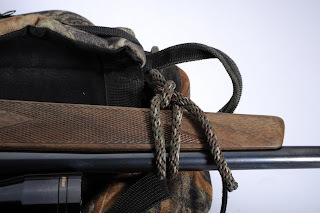 Again, a loop around the stock just under the sling swivel stud keeps the rope from slipping off and keeps the muzzle pointed up so that it doesn't get jammed into the dirt, thus avoiding any possibility of a very dangerous barrel obstruction. Obviously, this should never be done with a loaded chamber!!! Same method of tying a wrap and two half hitches, but pass the rope through the haul loop on your pack first. I've left this knot loose so that you can see how the rabbit goes around the tree and back down the hole. It should be tightened in actual use. 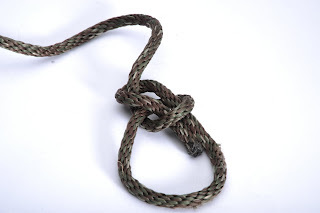 A very handy knot for tying down canoes, ATVs, Boone and Crocket deer, or maybe even your daughter's pink Barbie bike. 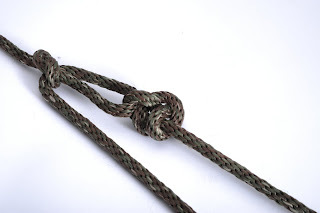 another very good knot to learn is the prussic (sp) and outstanding knot to use on safety gear. I use one on my climbing rope and this year I'll leave a hanging rope from any permanent stands and use the prussic to hook my vest to it as i climb. It's the climbers ultimate safety knot and quite easy to do. Good point about the prussic as a safety tool. I probably should have included it for that reason alone. When I was thinking of the knots I use most often, I absolutely forgot about the prussic in my safety harness that I use every time I climb a tree. Because it stays tied, it slipped my mind. Guess I'll have to do a follow-up video. Thanks for another great video, well done Sir. 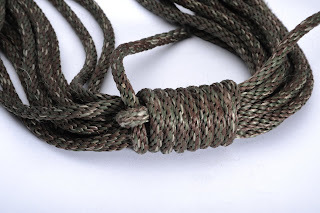 quiet prefferably camo or any other color rope? Where to get rope really depends on what you intend to use it for. If your life is going to depend on it (rock climbing, rapelling, tree trimming, etc.,) you need to use rope designed for the specific purpose you have in mind. REI would be a good source for climbing and rapelling ropes. For more general purpose uses (where you are not going to be suspending your body by the rope) I would use normaly use a braided nylon rope that can be purchased in a variety of sizes at most home improvement, hardware, or mass merchandizer stores. I can't remember where I got the camo rope pictured above, but I believe it was at BassPro or Academy Sports. Great instructional video. What length, size, and quality of rope would you recommend for all around general purpose use?